I honestly don’t know what to say. But the news is true. I can’t believe it. 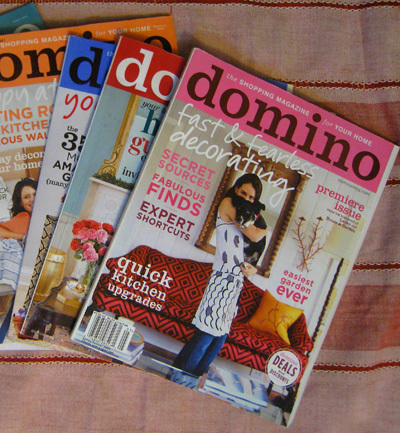 I worked at House & Garden that closed in November 2007 and now domino too. Am I cursed? I’m totally sad and wondering what will happen to all my favorite magazines? Join the discussion over at design*sponge. p.s. what do I do now, paint? Obama Is Our Next President! I echo the lament above about losing Blueprint and Domino. Ugh. I was also a fan of Cottage Living which is also defunct. Sorry you lost your job because of the downturn. I enjoy your blog a lot and keep us posted on how a creative person survives this downturn. Just got my John Robshaw catalog yesterday, thanks to a recommendation from you. Oh my goodness this means you lose your job – I'm so sorry. Hang in there – silver lining and all that. You can keep blogging. This one is one of my faves! Good luck! I agree, I think your content is really good – go get some sponsors! So sorry, Katy. I love your blog. You're a great writer and a creative spirit. Something good will develop for you. Thanks for for all your nice comments. Blackpearlpress I appreciate the comments and advice. It gives me motivation! By the way, I hope I'm not overstepping my bounds in saying that. Has just occurred to me that I might have been a bit bossy-sounding (not unusual). Yours is one of my most favoritest blogs — just thinking it could also be outrageously fabulous while paying for your renovations. Miss Elliott: aside from the fact that you are an incredible resource for design tidbits and myriad unique sources (look at your posts on plaid blankets!) you are also renovating a darling house from the ground up. Make that more of a focus, documenting the process a bit more, and add some sponsors. You are very well-poised to spin this into something fabulous, more of a site than a blog. Do not despair! It's terrible news, and I feel badly for you and all of the other talent behind the magazine, but I have no doubt you'll pull through. It's so so sad. And kind of scary, to be honest. I knew the ad sales were grim – I just had no idea it was this bad. It's bloggers like you that will keep going what domino leaves behind. I really think. i'm so sad. i will really miss them. they filled a void that nobody else did. ARGH. argh argh. want blueprint and domino back right this minute. Wow kate I am so sorry.